Salon du Garage is an ongoing platform for work. 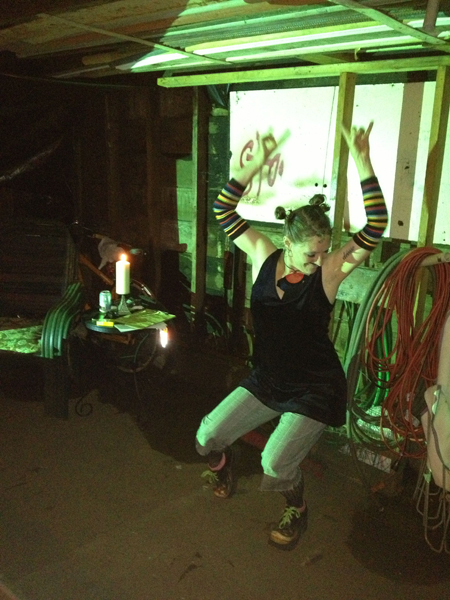 Having performed in the grand spaces of German opera houses, festivals in Monaco, and New York City theaters, Dawn Stoppiello also presents intimate performance installations in her home garage. A garage is a space where things get worked on. As a method of working on herself as a solo artist through group council, Stoppiello and audience together play out structured improvisational movement scores that are both silly and serious. I call the primary creative method used for these events PPP for Portable Performance Process. 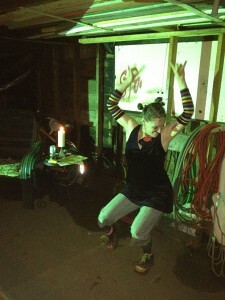 Salon du Garage is a site for experimentation in close-up, informal, improvisational, participatory performance making. These fun casual events began as part of my graduate studies but have evolved into a series of performance events that allow me to remain consistently artistically active outside of the formal structures. Performance is an inherently social form. I perform to stay connected to others and I seek to make performance an act of my “everyday”, as valuable as working in the garden or making dinner. I hope you will come again, or for the first time, and bring someone that I don’t know. I’m always looking to meet new people.